My all-time favorite comfort food is Orange Juice Chicken which my mom made as the family supper on many Sunday afternoons. It was almost always served with mashed potatoes and homemade gravy, and often she’d throw carrots, onions and celery in the roaster with the bird. Younger sister Kathy (aka Lolly), said it was her three kids most-liked meal growing up. Over the years, I have morphed the recipe into my own version, but the end product is the same — a succulent poultry dinner packed with flavor! My mom’s recipe called for melted butter added to Kitchen Bouquet that was basted all over the bird before going in the oven. About 30 minutes into the cooking process, she would pour a small can of unfrozen orange juice concentrate over the chicken and return it to the oven, basting it every so often with the juices until it was done. (She would use a large can of the OJ when roasting a turkey.) While the bird was resting, she would make this rich golden-orange gravy from the pan sauces, that to this day, I absolutely love. Years ago when I started cooking my own OJ Chicken, I did so in a Romertopf cooking vessel (a process of cooking food in a pot made from unglazed & natural clay.) I would stuff the bird cavity with shallots, celery, rosemary and lemons — preferably Meyer lemons. The food inside the clay pot loses little to no moisture because it is surrounded by steam, creating a tender, flavorful dish. The evaporation of the water prevents burning so long as the pot is not allowed to heat until it is completely dry. Because no oil needs to be added with this cooking technique, food cooked in clay many times is lower in fat compared with food prepared by other utensils. Clay pots also seal all the nutrients inside the pot by locking steam in. My vessel of choice changed years later after we bought Big Red, our enameled cast-iron Le Creuset roaster. And by this time I was also prepping the poultry by rubbing a mix of roasted garlic, olive oil, fresh rosemary, salt and pepper under the skin before basting the exterior and popping into the oven. The bird emerges just as succulent in the cast-iron pot as it did in the clay roaster, just make sure to sear the chicken’s exterior on all sides before adding a tight lid and cooking. Because I have always cooked my OJ chicken by instinct and never followed an exact recipe, I do not have my own version to give you. But I did find this recipe on allrecipes.com which has some similarities; although it is cooked in a roasting pan instead of a clay or braising pot. Preheat oven to 350 degrees F (175 degrees C). Pour the chicken broth into a small roasting pan, and set aside. 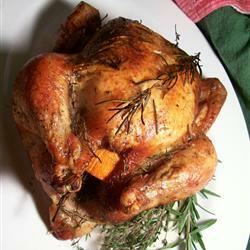 Loosen the skin from the breasts and thighs of the chicken. Stuff the butter pieces evenly underneath the skin of the chicken, and place into the roasting pan. Squeeze the orange halves over the chicken, and stuff the orange halves into the chicken cavity. Tie the legs together with kitchen twine. Sprinkle the chicken with salt and pepper to taste, then rub in the minced garlic. Drizzle the melted butter all over the chicken, then lay the herb sprigs onto the breast and around the legs. Cover the dish with aluminum foil, and bake in the preheated oven for 20 minutes. Uncover and baste the chicken with the pan juices. Continue cooking until the chicken is no longer pink, or until a meat thermometer inserted into the thickest part of the thigh reads 165 degrees F (74 degrees C), 1 to 2 hours. Baste the chicken every 10 to 15 minutes after you uncover it. Once cooked, allow the chicken to rest out of the oven for 10 minutes before slicing. This whole roasted chicken turns out terrifically flavorful and tender, and the broth left in the bottom is a perfect gravy in itself! I’d love to hear from you after you try your own variation on Orange Juice Chicken! Every December while growing up, my mom would whip up several batches of the cookie dough and then allow the five siblings to cut out shapes using cookie cutters. Once cooled after baking, we’d get to decorate with colored frosting and an assortment of sprinkles. Kids being kids, I think we ate more than we actually finished decorating. And I have to tell you that, before I knew too much about color theory, some of the frosting colors I created left a lot to be desired! You can make many batches because the cookies (frosted or unfrosted) can be stored in the freezer for months and taken out at a later date to enjoy all over again. I remember it being a real treat when mom would take them out of the freezer in spring for us kids to enjoy, but something tells me, she loved them every bit as much as her kids did! Now Russ’s three children are all in their 20’s but they still love the cookies as much as they did when they were younger. And since we have many neighborhood kids aged 5 and under, we’re starting to spoil another generation with these special cookies during occasions including Easter, Halloween and Christmas — and believe me, the parents look forward to getting them also! Cream softened butter in mixer. Gradually add sugar. Add vanilla to beaten eggs and pour into creamed butter mixture. Sift flour with baking powder and salt, and add to mix master. If desired, add food colorant to dough. Make dough, wrap in wax paper and refrigerate overnight, or for at least 4 hours. Roll out the dough to about 1/8″ thick onto a pastry cloth or countertop sprinkled with flour. If you do this in sections, keep the unused portion in the frig. Bake in oven for about 8 minutes, until just barely starting to brown underneath. 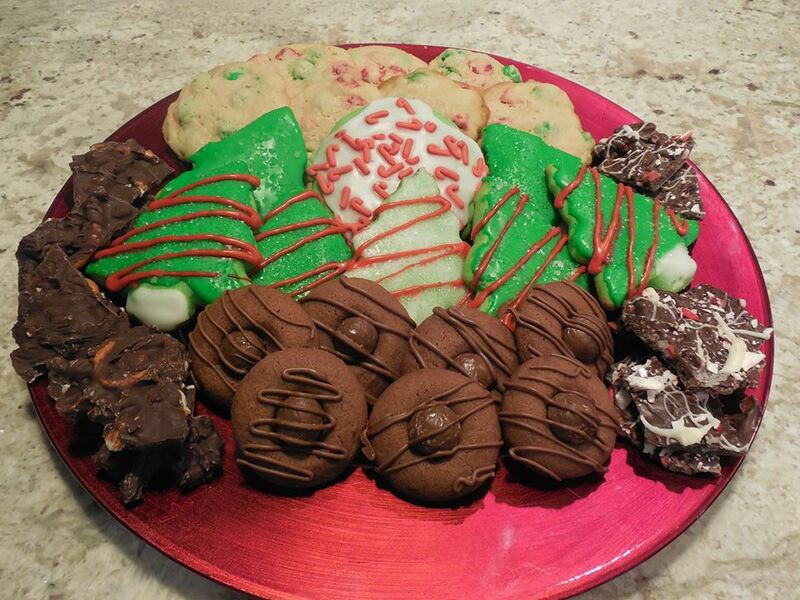 Place cookies on rack to completely cool before decorating. 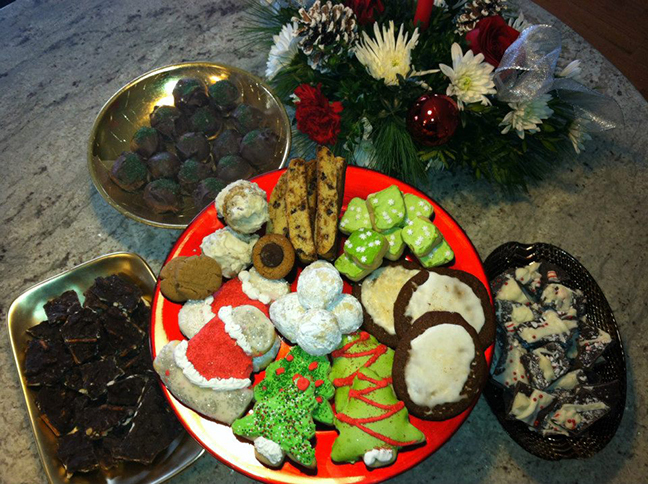 When we decorated the cookies with my mom as kids, the frosting was made simply with confectioners sugar and a few drops of water. Start with a bowl for each color you intend to make and add the water a few drops at a time until you get the right consistency. Remember, when you add food colorant, that also has some moisture to it. If the frosting is too runny, simply add more confectioners sugar. Many years back, I came across the “Royal Icing” recipe that includes powdered meringue. This takes a little more time because you have to whip it in a mixer for about seven minutes. The end result is a stiffer frosting with more of a matte finish that can be better manipulated and piped around the cookie edges before filling in. I also found I can “sculpt” with it using a variety of kitchen tools like toothpicks and forks. Beat 3 Tbsp meringue powder with 6-8 Tbsp of warm water and 1/2 tsp. vanilla. Beat in 1 pound confectioners sugar on high for 5-7 minutes. If you want to keep white frosting, take some out of the mixer and then add food coloring to the rest and beat until color is mixed evenly. Make sure the frosted cookies are COMPLETELY dry before stacking them on top of each other. This could take up to 24 hours. 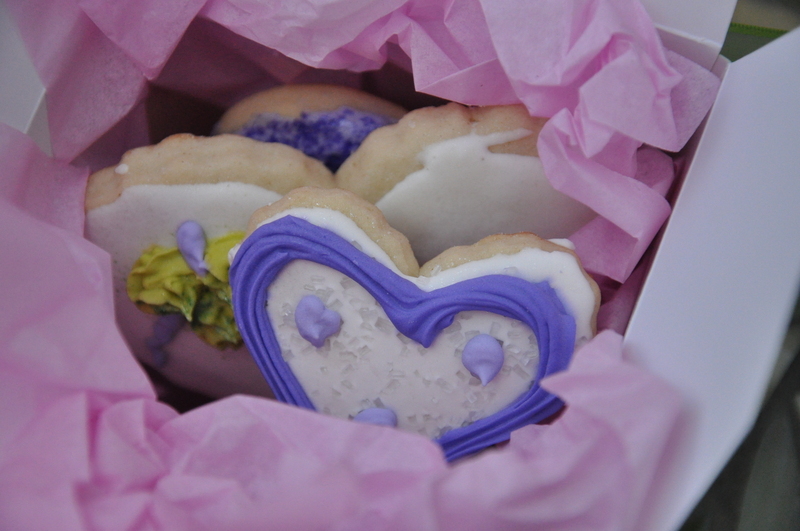 These heart shaped cookies are usually made for Valentine’s but were specifically created as favors for our wedding guests. 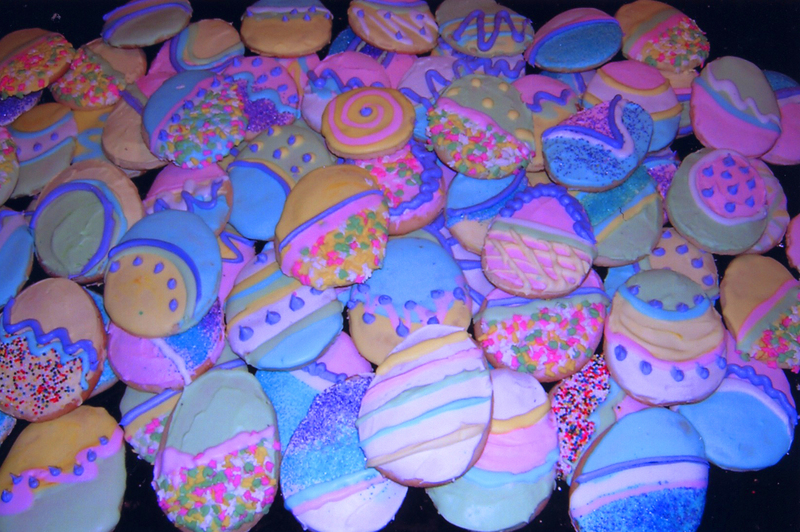 Using only one cookie cutter style, Lynn made dozens of variations on the Easter egg. 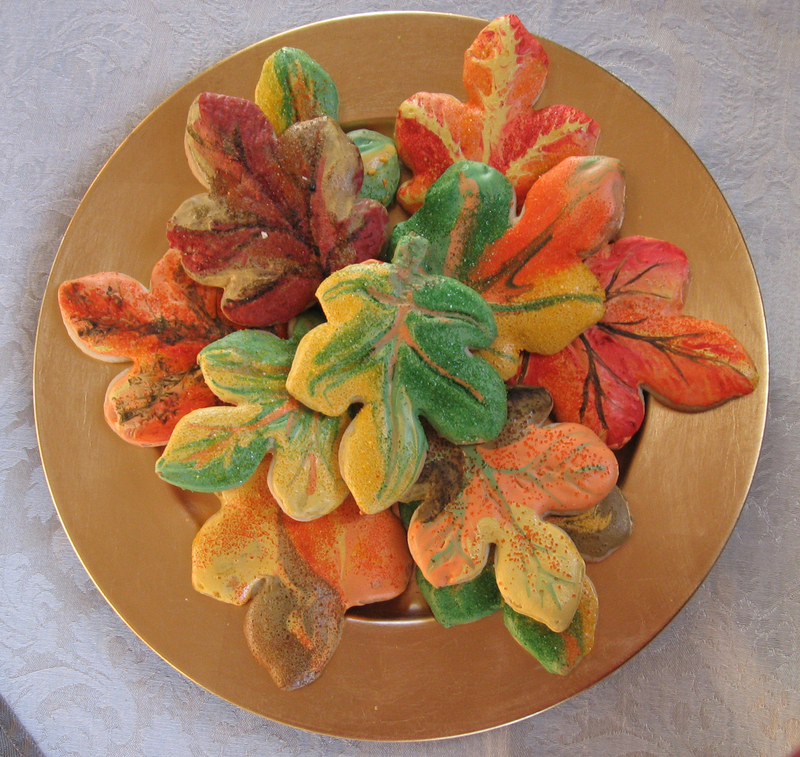 These leaf cookies were made for a Thanksgiving dinner party. 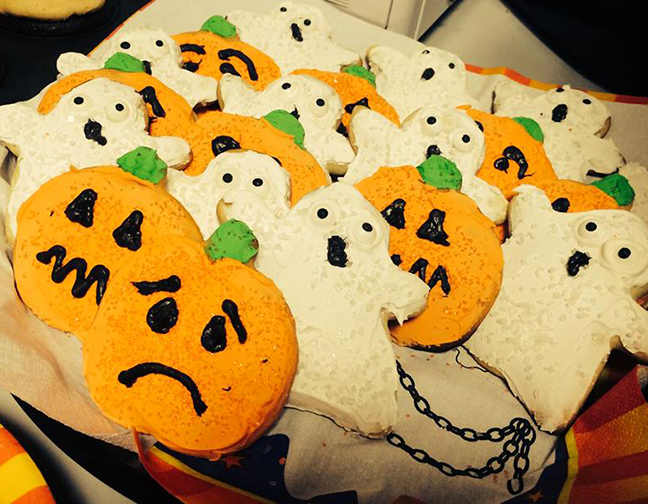 These Halloween cookies were specifically made for a coworker’s going-away party because her last day was October 31— and we were all sad. 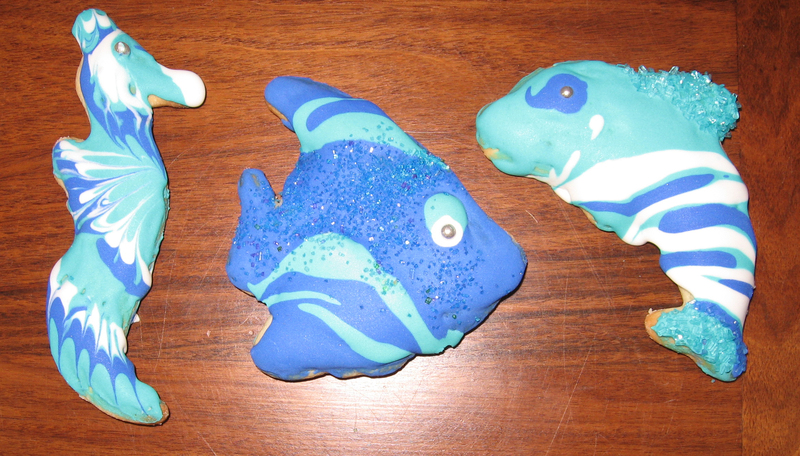 A few examples of the fish cookies made for a marketing conference that was held in Annapolis, MD. 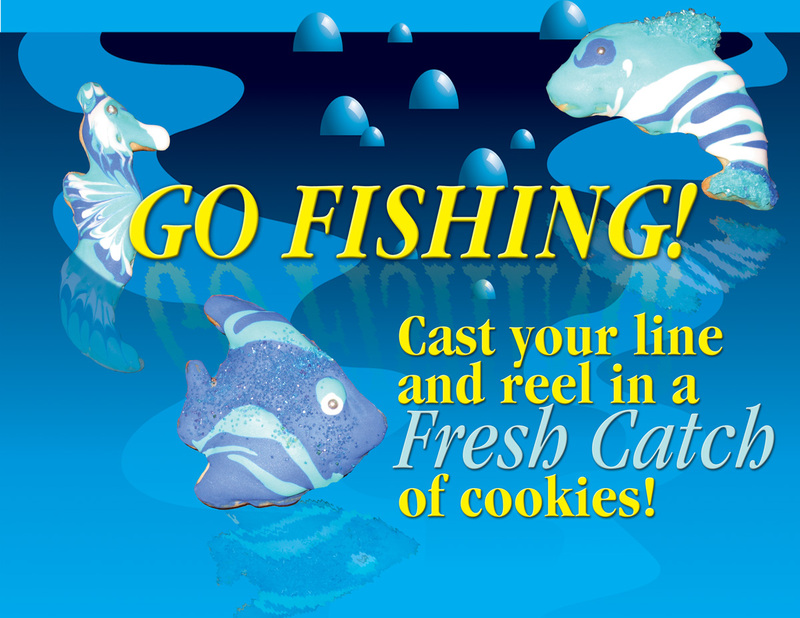 Lynn and Russ’s cookies are delicious and “almost” too pretty to eat!